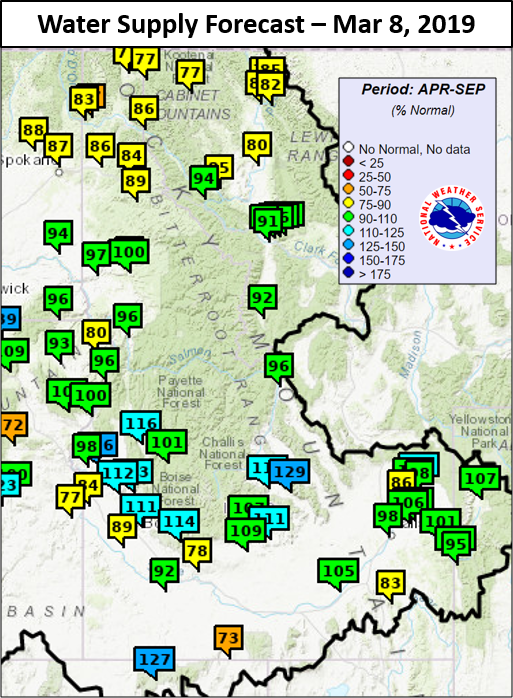 The potential for spring flooding due to snowmelt is slightly elevated for much of the central Idaho Mountains, particularly in the Big Lost and Wood River Basins, as well as the Upper Boise, Payette, and Weiser Basins. For the remainder of the state the spring flood potential due to snowmelt is average. The primary factors in the development of spring flooding are the occurrence of persistent above normal temperatures, and rain on snow precipitation events. Even for areas that may have low snowpack, spring flooding is possible under the right scenario. Additionally, wildfire burn scars can have a significant impact on local flood potential during spring snowmelt. 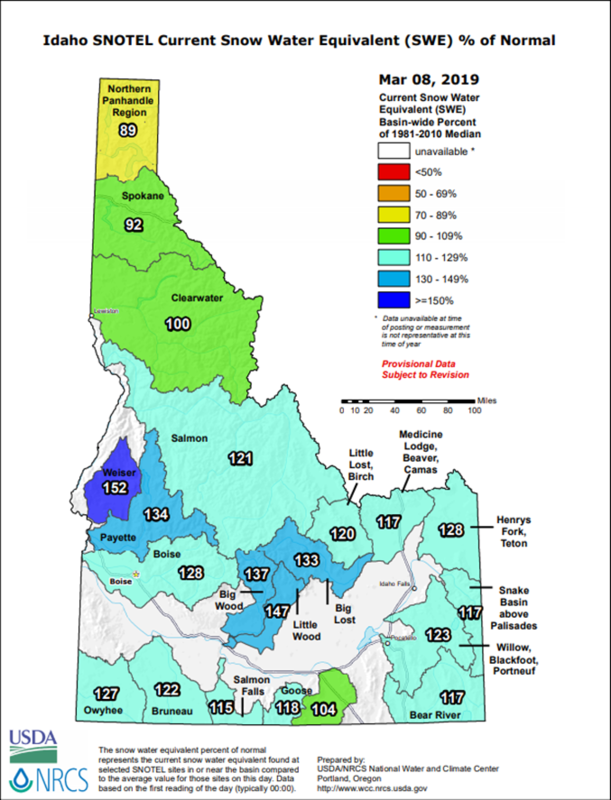 The water supply forecast for the spring and summer of 2019 is near average for the majority of watersheds across Idaho. 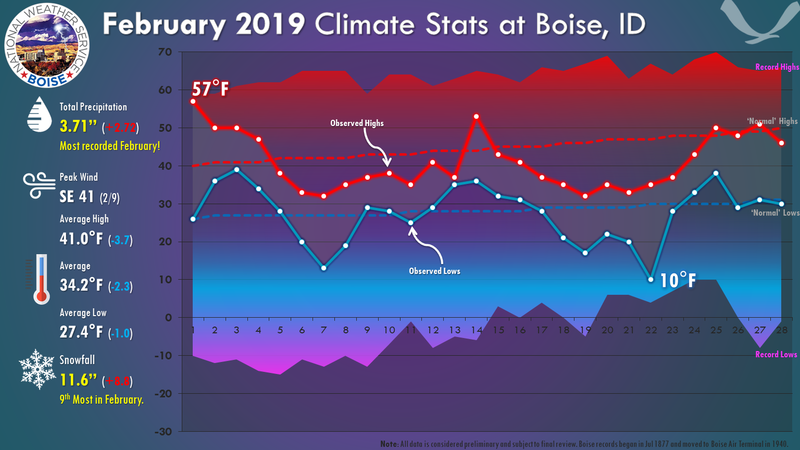 Exceptions are some above average forecasts in the central mountains and Upper Snake Region, and some below average forecasts along the southern border and in the Idaho Panhandle. Wet weather at the beginning of the Water Year (Oct. 2018) was beneficial in recharging the soil moisture after a very dry and warm summer. 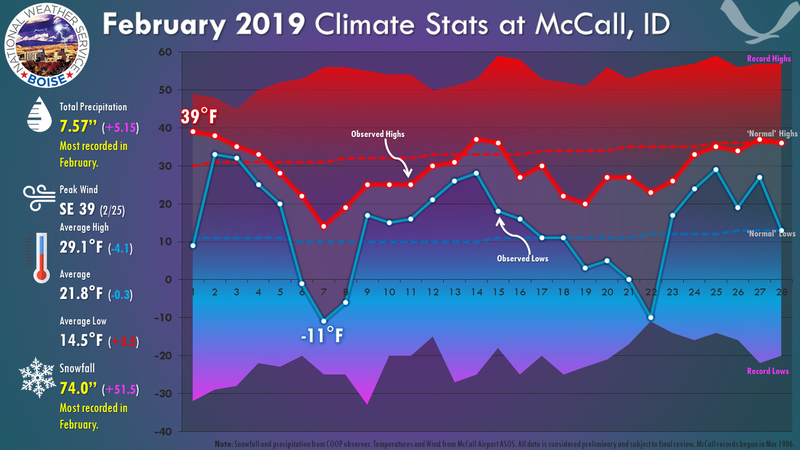 However, fall precipitation as a whole was below normal across the state and subpar precipitation continued through most of January. 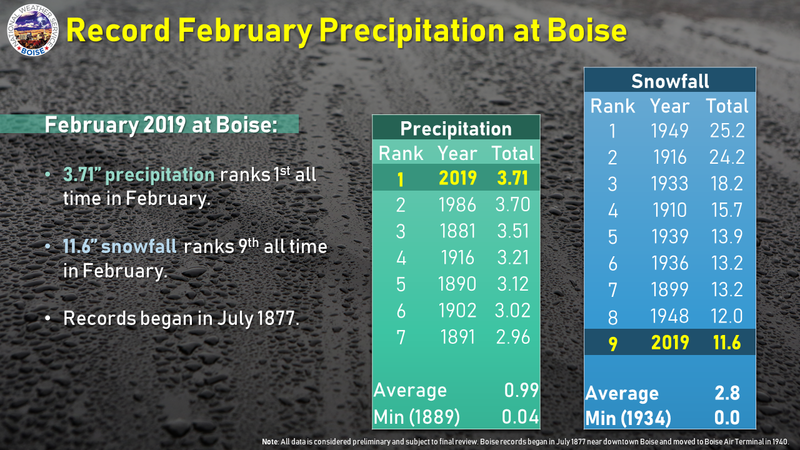 February precipitation was exceptional across west-central and southern Idaho with much of the area receiving 200 to 300 percent of normal. 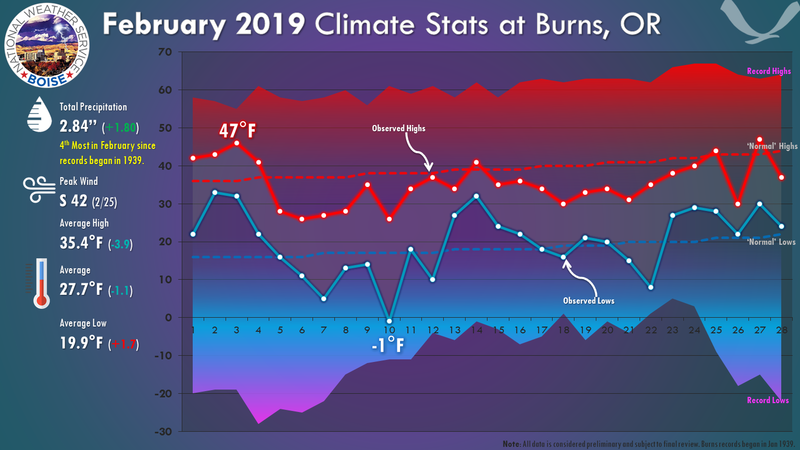 February temperatures were well below normal across the state, especially in northern Idaho. 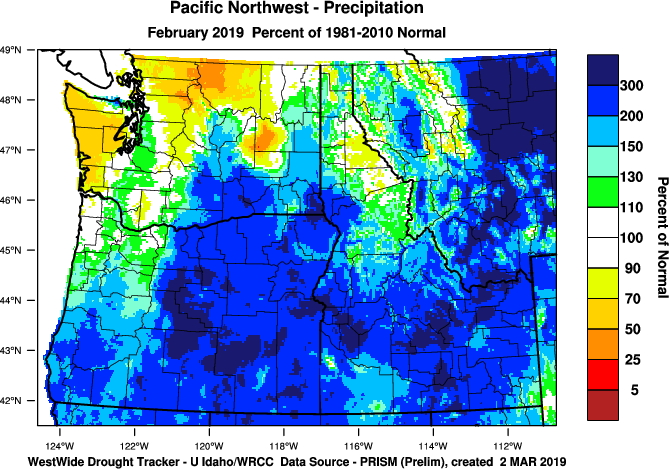 Precipitation for the 2019 Water Year through February has been normal or above normal for most of central and southern Idaho, and a little below normal for most of the Panhandle Region. 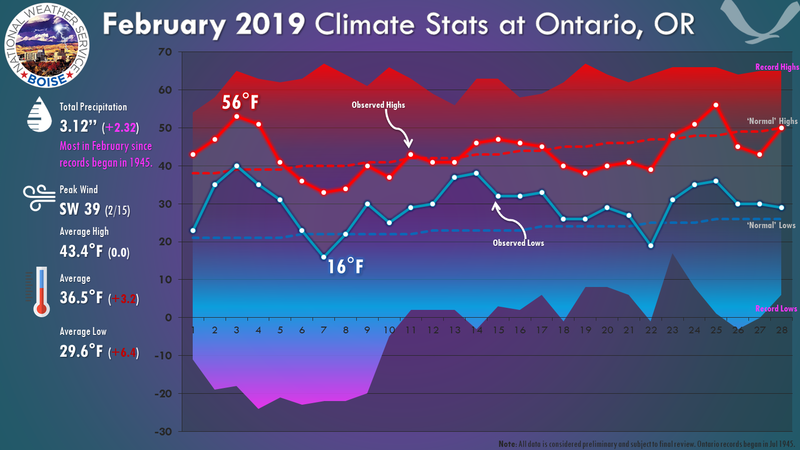 Mean temperatures for the 2019 Water Year have been near normal. 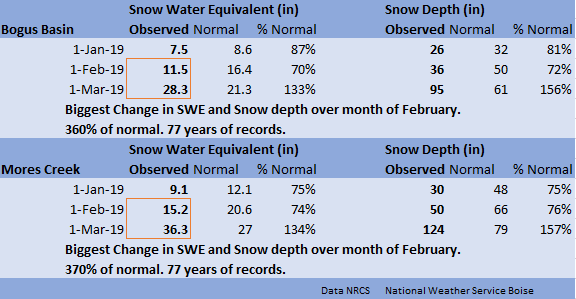 As of March 8, snowpack from the Salmon River Basin to the southern border was above normal. 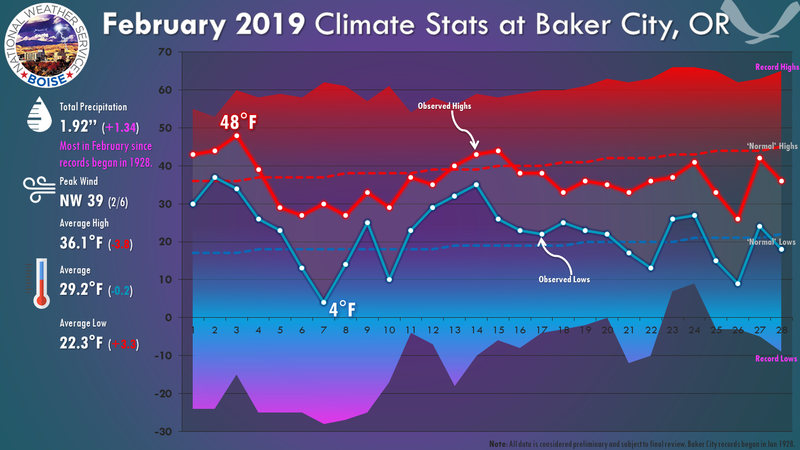 The highest percentages were in the Big Lost Basin, Wood River Basins, Payette Basin, and Weiser Basin, ranging from 133 to 152 percent of median. 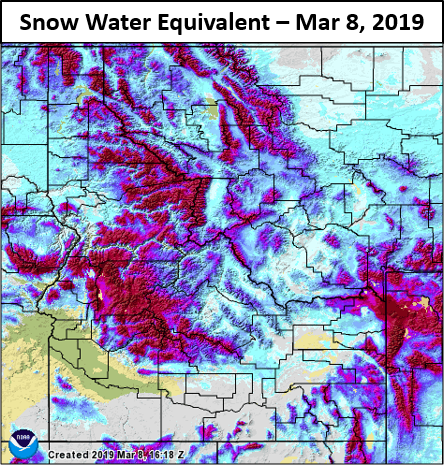 Northern Idaho snowpack varied from 89 to 100 percent of median for the Northern Panhandle, Spokane, and Clearwater Basins. 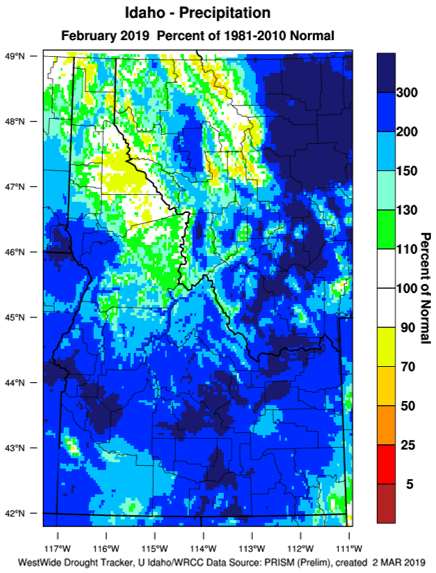 Idaho snowpack as a whole typically builds through March and peaks in early April. Reservoir storage across Idaho is in good shape as of early March with major reservoir systems holding near average or above average water. Across southern Idaho, reservoir storage in the Bear River Basin was near 140 percent of average and Southside Snake River Basin storage was near 95 percent of average. The Upper Snake Basin and Wood River and Lost River Basins was near 125 percent of average. Storage in West Central Basins was near 98 percent of average, and the Clearwater and Panhandle Regions were near 97 and 104 percent of average. Weather patterns, irrigation demand, and flood control needs will drive reservoir operations over the next several months. Wet spring weather or extended periods of above normal temperatures resulting in rapid snowmelt could result in significant increases in reservoir outflows and river levels. 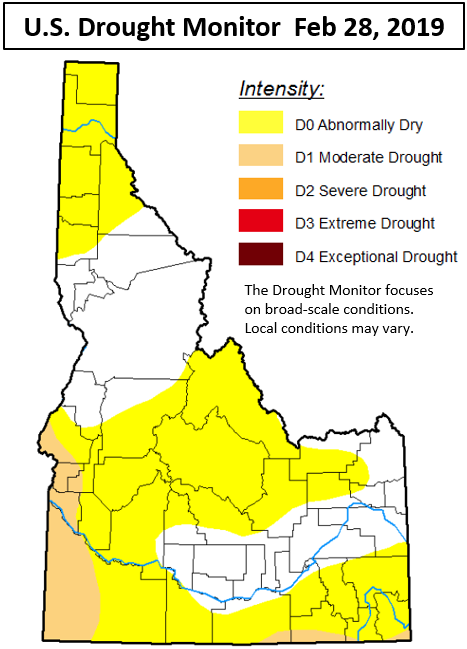 Moderate to severe drought plagued portions of Idaho through the fall and early winter, especially across southern Idaho and near the Utah and Nevada border. 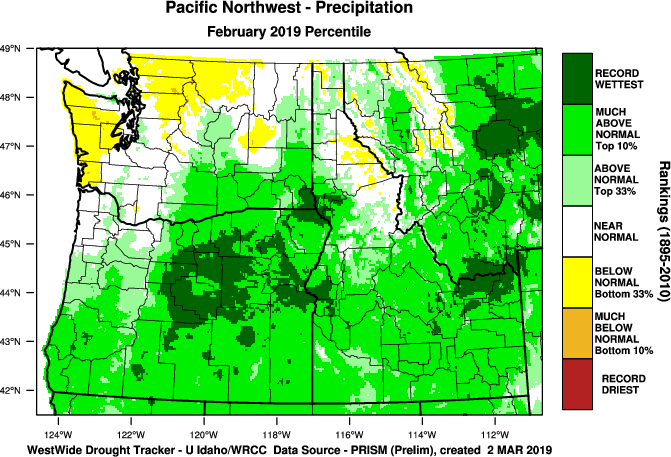 Drought conditions were eased by well above normal precipitation and a large increase in mountains snowpack during February. The latest U.S. Drought Monitor shows lingering drought across far southwest Idaho and along the Utah border. 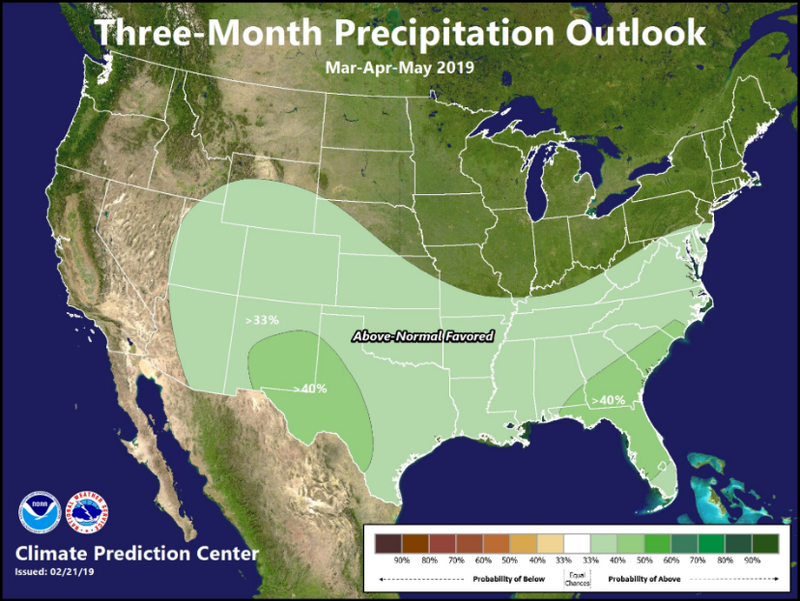 Weather and precipitation for the remainder of winter and this spring will determine whether or not drought conditions continue to improve or deteriorate. 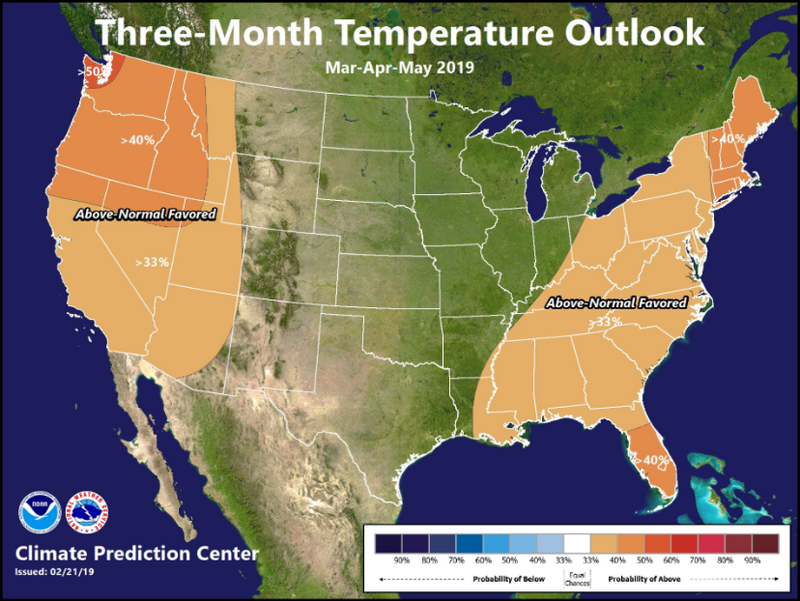 The outlook for March through May favors above normal temperatures across Idaho. 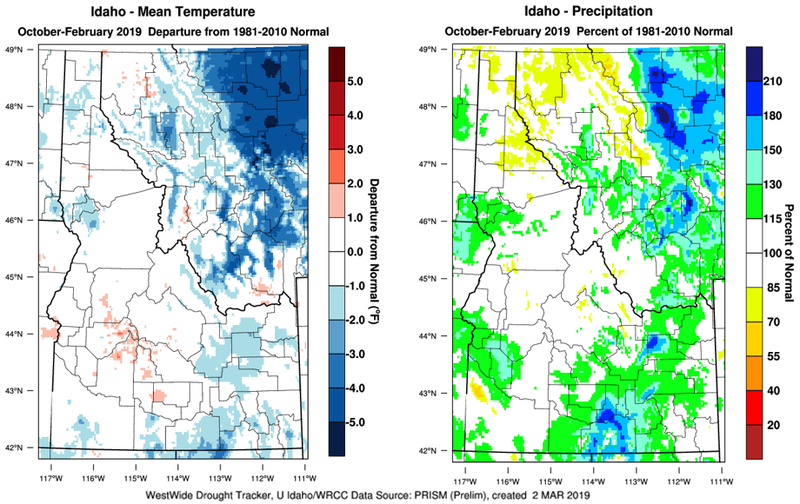 The precipitation outlook slightly favors wetter than normal conditions over far southeast Idaho, but does not shift the probabilities one way or another for the rest of the state.